Scammers are getting more sophisticated all the time so you have to step up your efforts to protect yourself from identity theft and financial fraud. Thieves that perpetuate scams typically target those they feel are most vulnerable – older Americans, immigrants, the unemployed, poor and those already in debt. This is unfortunate, because these are the people that can least afford to be taken advantage of. Everyone is scared of the IRS – even those that pay their taxes like clockwork and never take one step out of line. But let's face it, the tax code is so confusing that it's quite believable that you made a mistake on your tax form. This scam preys on this fear and confusion. Here's what happens – you get a call saying it's from the IRS and the caller ID even spoofs an IRS number so that it looks legitimate. They may even have the last four digits of your social security number to further substantiate the caller's credibility. 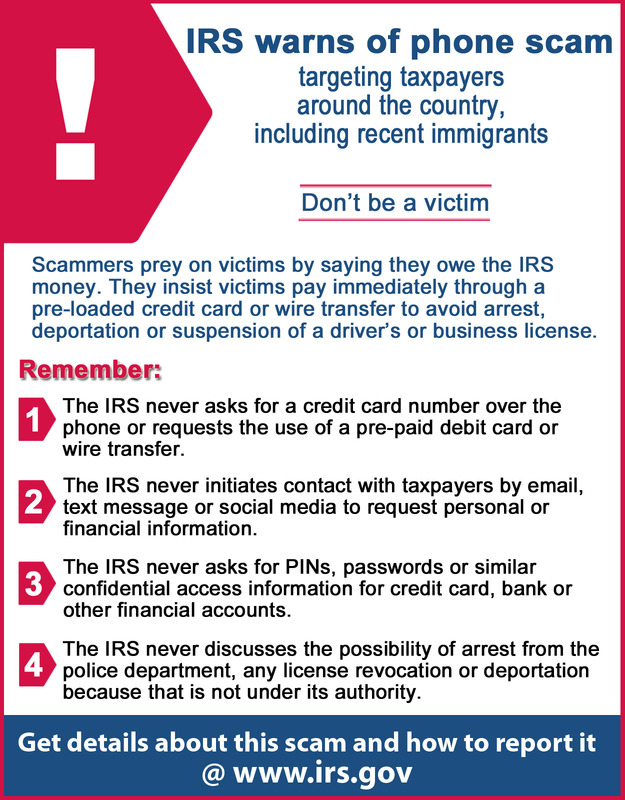 The scammer tells you that you owe the IRS money and that if you don't pay up ASAP, you'll have your driver's license revoked or criminal charges filed. Any money you give them is lost for good. The IRS communicates the old fashioned way – via US Mail, so hang up on any calls and ignore any email demanding money and making threats. Read more about this phone scam here. Similar to the scam above, this one uses the IRS to strike fear in the hearts of its victims, but in this case they target immigrants – even those that already have their green cards or citizenship. The caller again states they are from the IRS and that a big tax bill is owed. This despicable scam then tells the victim that if they don't pay up, they will be arrested and the rest of the family deported. They demand immediate payment usually though Green Dot Money Pak pre-paid debit cards (a favorite for scam artists). Victims of this scam say that the callers are very convincing, very intimidating and have enough information to really sell the fraud – including faked IRS caller ID, fake badge numbers and “call center sounds” that can be heard in the background. Hang up on any call like this and contact the Federal Trade Commission's Complaint Assistant department for help. This scam represents a new low in scams – it's a fraudulent call based on fake fraud. What makes people so vulnerable to this scam is that we're so worried about being defrauded that we're more likely to listen to a caller who masquerades as someone trying to help. In this case, you get a call claiming to be from the fraud department of your credit card company. They will likely already have your name, address and credit card number. They will then ask you for the three digit code off the back of your card as a “verification” and that's the last thing they need to duplicate your card and use it to run up charges or as part of a larger identity theft scam. Never give out the code on the back of your card to a caller. Instead, hang up on the call and then dial the 800 number on the back of your credit card and report the interaction. If the call was legitimate (likely not the case) they can connect you to the fraud department. If you're deep in debt, the last thing you need is to be taken advantage of by a scammer. Protect yourself from these and other fraud attempts by never providing personal or financial information over the telephone and contact the North Carolina Department of Justice if you think you've been the victim of a scam. And if you need help getting out of debt once and for all, contact the law offices of John T Orcutt for a free consultation on whether Chapter 7 or Chapter 13 bankruptcy can offer the relief you need.